Considering the fact that Maithon is one of the most beautiful places in and around the region of Dhanbad, it is also known as the Kashmir of Koyalanchal as the region is rich in coal mines. Located on the banks of river Barakar, Maithon is immensely popular for Maithon Dam, which is said to be one of the most successful river valley projects in India. As the temperature remains bearable throughout the year, it is becoming popular amongst tourists too, who come here to take a break and escape the summer heat. If you are one amongst these seasonal tourists and are looking to enjoy the natural beauty of Jharkhand, then Maithon is the perfect place for you this weekend. Being easily accessible by road, it has started witnessing local tourists in hundreds every month. So, how about taking a break here and exploring the richness of Maithon? Read on to know more about the prominent places to visit in Maithon. Maithon has become a synonym to Maithon Dam over a period of time. Being one of the largest and most beautiful dams in India, it is a vast reservoir with blue waters and green surroundings and was created to cater to the needs of surrounding towns and villages. 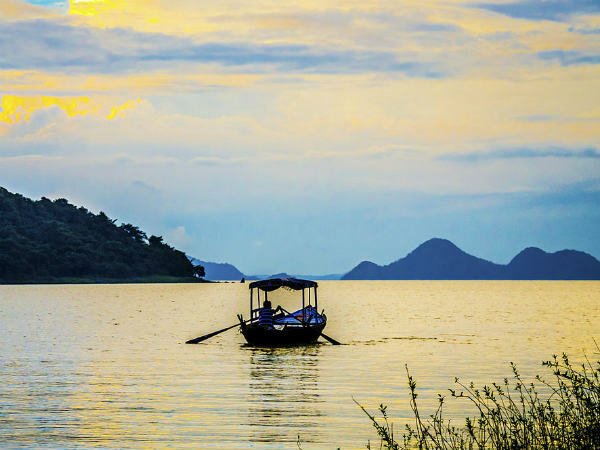 If you are looking forward to witnessing the beauty of Maithon Dam Lake at its summit, then it is advisable to get yourself here at the time of dusk. You will certainly be speechless after encountering the spellbinding beauty of this marvellous lake. Kalyaneshwari Temple is one of the most visited and oldest temples in the Dhanbad district. It is dedicated to Goddess Kalyaneshwari and hence, it is visited by several childless women who come here with their prayers of getting a child. As per legends, it is said that the temple is 500 years old and human sacrifices were made as a part of worshipping Goddess Kalyaneshwari in the past. Being located on the banks of Barakar river, the surroundings of Kalyaneshwari Temple provide its visitors with a soothing and composed environment. So, what do you think of visiting Kalyaneshwari Temple this weekend? Another beauty, located in the midst of Maithon Lake, Spoon Island is certainly a place which you must visit to feel the essence of calmness and tranquillity in Dhanbad. Resembling the shape of an inverted spoon, this small yet picturesque island is definitely a treat to experience. As the island is inhabited by certain wild animals, it is advisable to not access this beauty without a guide. Being easily accessible by boats, it is also an ideal destination for fishing. Also known as Sabuj Deep, Spoon Island should not be missed while in and around the region of Maithon. Deer Park is another prime attraction in Maithon which attracts several nature lovers and photographers. Even though photography is prohibited in this area, there are still several dedicated photographers who somehow find a way to capture the beauty of charming deer in the park. As per records, there are more than 50 deer in the park. Being surrounded by the small streams coming from the dam, the panoramic views of the Deer Park are certainly set to enhance the overall beauty of Maithon. Wouldn't you love to get yourself here and savour this unseen beauty of Jharkhand? Kali Pahari is famous amongst locals for its ancient temple which is dedicated to Goddess Kali. During the festival of Durga Puja, the temple witnesses several Hindu devotees who come here to worship their deity and provide her with several offerings. Even though the current building of the temple is not very old, it is still believed that the temple has been in existence for centuries. So, how about taking a tour of Kali Pahari and exploring its surroundings? Apart from the above-given places, you can also explore the beauty of Phoolbagan and Millennium Park. Flower shows are held occasionally every year. Hence, you can also witness some of the rarest species of flowers in this beautiful park. Another place in Maithon which can be explored is Pahari Baba Mandir. Located atop a hill around Maithon Dam, Pahari Baba Mandir is not easily accessible due to the absence of proper tracks. Hence, one needs to be very careful while accessing this old temple.